Hmm, this is interesting to think about. Coming from someone who is mindful of her audience and doesn't want to main point to be overshadowed by misunderstandings, I understand the trigger warnings and emphasis on gratefulness. But I also think you're in a different category. It shouldn't make a difference, but I believe it does. I guess it all depends on your motivation. If you are writing primarily for yourself, as a means of self-expression and/or recording & sorting out & putting forward & reflecting upon your own thoughts & experiences, then what other people think isn't going to matter as much. If you want to attract an audience and followers & comments and make a name for yourself as a blogger, then you will probably think more carefully about what you say &/or how you say it, and worry about whether people are offended by your subject matter. I sometimes want to tell some of the PAIL bloggers I read not to worry when they apologize about writing about their kids or tag posts "children mentioned," etc. For the most part, I know they have kids; it's often evident in their blog name, or post title, or their blogging profile. If I didn't want to read about their kids (or expect to read about them, at least occasionally), I wouldn't be reading the blog. I'll be interested to read your own thoughts on this subject. 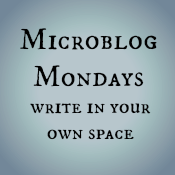 When I started blogging, I did it for myself. Gaining readership wasn't even on my radar, and while I enjoy the fact that people read my blog and interact with me through comments, it remains for me. The only thing I vowed to do from the beginning is to not put a lot of cursing on my blog. While I can throw around words that start with F and rhyme with truck like a pro in real life, I know that not everyone appreciates this sort of language. In the beginning I sort of put it all out there without worrying about offending anyone, but I admit now I temper what I write somewhat. And I'm guilty of using qualifying statements such as "I know it sounds horrible, but...."
Right now I feel like I'm walking a fine line between wanting to become a more vocal advocate while simultaneously wanting to protect my anonymity. I feel like I can't have both, and I definitely don't want some people (e.g., my sisters) to read my blog. But like you've said before, our blogs aren't democracies and we can choose to publish or not publish whatever we want. People get to choose how they respond, whether it offends them, etc. Such an interesting point. I have had comments recently where people do not agree with my frustrations, or feel I am comparing too much, or deal with things in a different (more religiously-based) way. I am not going to stop processing my experience because of these comments, and I always publish them because it is a different perspective. However, I maintain that my blog is my blog, and I am not going to censor my thoughts on MY EXPERIENCE because someone else doesn't approve of how I go about that. I was genuinely mortified when an offhand comment I made in a post about wishing menopause would come early offended someone who was in early menopause or POI in her thirties, and I could tell she thought I had been cavalier about something that was a serious, devastating issue for her. In fact, I meant I wanted menopause to come in my 40s because I am so done with that farce, and I apologized to her and explained that wasn't what I meant. I don't apologize for feeling a contrast between my life and others, or being upset by social media things. As for parenting or pregnant blogs, I appreciate trigger warnings but don't think they are necessary. If I know you are pregnant or parenting, I have a pretty good idea that you are going to discuss those things and I visited you, so that's kind of on me. I hate the double standard that you try so hard to become pregnant or a parent, and are judged for complaining about that, but then when/if you do become pregnant or a parent, you are expected to feel nothing but sunshine and roses, lest you be deemed ungrateful. That's BS. I think you could be able to write about your own experience without constantly censoring or worrying about offense. That said, I am a bit more careful about phrasing since finding that some things could be considered offensive to someone in a slightly different situation, but that's just being reflective and my own choice. That's what it comes down to -- if you're writing about your life, and this aspect of your life, then the truth is the truth is the truth. I love BNB's reminder that you've said our blogs aren't democracies. I just aim to be honest but not hurtful... but it's inevitable that people will disagree or take issue with something that you've written. Great post, got me thinking! Oooo this is interesting. Once my daughter was born, I did blog mostly about her. After all, my blog was about my journey, a record so to speak about how crazy/awful/wonderful the last 6 years have been. I touch on infertility as it is still a big part of my life. While I appreciate blogger's trigger warnings, I decided not to go that route. Mainly because almost all the bloggers in my circle were all successful themselves. They're all really good questions. And I think it begins with the idea: Is the blog for the writer or the reader? Joining the chorus: good questions. I think it pays to be mindful of the audience--whatever the size--but you may feed your own soul as well. I'll also add (on the speak your truth side) if everybody is nervously trying to please everybody else, the point of having individual voices is lost.